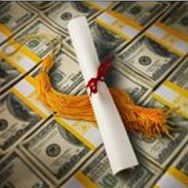 College affordability is a challenge for many families. The majority of financial aid and scholarships come directly from the college, or from federal and state government programs, so it's important to focus your initial efforts there. Here are some good financial aid explanations from Turbo Tax. Here's a list that indicates which schools give merit aid, and approximately how much they give. Here's another site you can use to calculate your EFC. The FAFSA is available October 1 every year. Submit it during the month of October of your senior year. Waiting may mean that your desired school runs out of funds, so don't delay! Here's good FAFSA Resource Guide in case you get confused. Many private colleges and universities require an additional financial aid application called the CSS Profile, which is available fall of senior year. If you are applying early decision, be sure to fill it out by November 1 of senior year. At the latest, it is best to complete it by February 1 of senior year. Be sure to check the college's website because deadlines may differ! If you live in Oregon and want advice from a CPA who specializes in college financial planning I suggest Susan Yang. Here's a good source for general money management tips. Outside scholarships can be a great supplemental resource and there are lots of tools to help you find them. Remember that scholarship hunting is very time consuming, and the best results come when you start early (sophomore year) and devote enough time and effort to the quest. Many scholarship search sites will bombard you with emails. You may want to create a separate email address just for your scholarship searches, but if you do, be sure to check it on a very regular basis! The OSAC Scholarship application aggregates hundreds of scholarships that pertain to Oregon students. make sure to check the entire list very carefully and add all that apply to your submission list. All Oregon students should fill it out by February 1 of senior year. Essays are required so start early! The Hispanic Metropolitan Chamber (Portland area) offers annual scholarships for students of Hispanic ancestry living in Oregon or Clark County, Washington. Applicants are evaluated based on their academic achievements, extracurricular activities in the community and a written essay.